1. Dollar Dog Day - June 3rd, 12-2pm at Elgin Municipal Pool in Morris Memorial Park, located at 803 N Avenue C in Elgin. With pool admission of $2/person ages 6 and up, you can enjoy hot dogs for $1 and chips & drinks for $0.50 each. 2. First Friday Art Walk - June 3rd, 5:30-8:30pm in downtown Bastrop. Food, shopping, live music, and of course, ART! Admission is FREE! 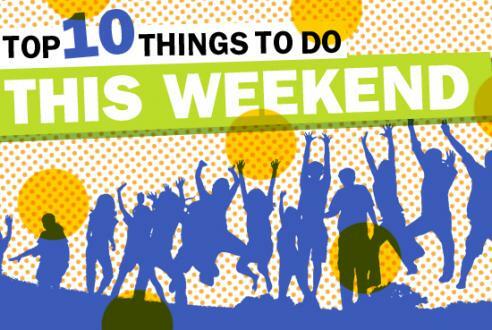 *More events in downtown Bastrop during FFAW: Drum Circle at Vibe Tribe, Pickin' on the Porch in the Crossing, and "Take Me Out to the Ballgame" at various downtown businesses. 3. Watercolor Painting - June 3rd, 7-9pm at Back Porch Ceramics, located at 913 Main Street in Bastrop. Learn the secrets of watercolor painting from artist Elizabeth Sullivan. $30/person; register online here. 4. Discover the Lost Pines Guided Hike - June 4th, 10-11am in Bastrop State Park. Join a Master Naturalist on a 1-mile guided hike. Free after park entry fees. *There is also a Discover the Lost Pines Guided Hike at Buescher State Park on June 4th from 10-11am. 5. Summer Reading Kick-Off Party - June 4th, 10am-12pm at the Bastrop Public Library, located at 1100 Church Street in Bastrop. Games & prizes, Ms. Poppy the Clown, drums, snacks, and more. Admission is FREE! 6. "Spoon River Anthology" - June 4th & 5th at 2pm at the Bastrop Opera House, located at 711 Spring Street in Bastrop. Presented by the Bastrop Opera House Youth Academy. Tickets are $5/person and can be purchased at the door or online here. 7. Car Racing - June 4th, 7-11pm at Cotton Bowl Speedway, located at 1175 CR 202 in Paige. General Admission: $12 adults; $10 seniors, students, & military personnel; $5 kids ages 6-12; kids 5 and under are FREE. Pit Pass: $30/person. 8. Salsa Dance Night - June 4th, 8pm-1am at La Hacienda, located at 1800 Walnut Street in Bastrop. Lessons are from 8:00-9:30pm and dancing is from 9:30pm-1:00am. $5/person cover, includes lessons. 9. Yoga! in the Park - June 5th, 8:30-9:45am on the patio at Neighbor's Kitchen and Yard, located in the Crossing at 601 Chestnut Street in Bastrop. Suggested donation is $10-20; a portion of the donation goes to Keep Bastrop County Beautiful. 10. Mad Hatter Tea Party - June 5th, 1-4pm at Wentworth Gardens, located at 151 Cedar Hills Drive in Elgin. Wear an Audacious Hat and meet the Mad Hatter! Hosted by the Cattlemen for Cancer Research Silent Auction Committee. Chair massages, face painting, bubbles, mask making and more. Admission is FREE, although cash or silent auction donations will be gladly accepted.